When it comes to this book, the majority of the reviewers say that it made them cry and broke their hearts... and they say it like it's a good thing. To me it always makes the book sound emotionally manipulative and that together with it being a New York Times bestseller made me wary. I was promised some impossible moral dilemma which always bring to mind Jodi Picoult - the queen of impossible moral dilemmas but after reading 'The Light Between Oceans' I'm afraid Picoult will have to hold on to her crown very tightly as Stedman is sure to give her a run for her money. I guess what surprised me most about this novel was how well it was written. Call me a prejudiced snob but I learnt not to expect that from the New York Times bestsellers. The setting - a small, isolated island off the coast of Australia comes to life loudly, with waves crushing against the cliffs. 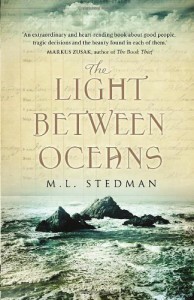 On the island - two people, the lighthouse keeper and his wife and a microcosm of their emotions. After repeated miscarriages Isabel finds on the beach a boat with a dead man and a very much alive baby. She takes it as a sign and insists on keeping the baby and pretending to be its natural mother. Tom is torn between doing what's right in the eyes of the law and what's right for Isabel. Here is how they both enter this moral cul-de-sac dragging the poor reader with them. It makes a perfect book club read because of the possibilities of endless discussions starting with: "Well, what would you do?". Quite honestly, having to empathise with every single character in this book was a very draining experience for a cynic like me. The payoff was the great descriptions of the lighthouse keeper's life - a life now truly lost, what with all the soulless computers and such. It's a shame because such a life lends itself beautifully to fiction. In fact, the only thing written by Sienkiewicz that I genuinely like is the short story called 'The Lighthouse Keeper' (which you can read here if you like http://www.readbookonline.net/readOnL...).